Enables popular weapon mods to work with `Visual Reload` mod by Pauderek. Pauderek - For the excellent mod and very easily extensible framework (and instructions!). Zerdidian - For adding ALL the Form entries to the WSE patch, and helping make custom mesh collisions meshes for it. 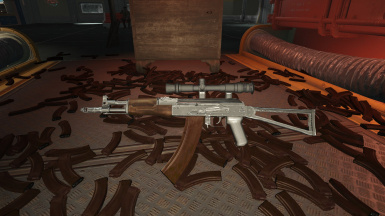 Cleaned Visual Reload - Assault Carbine v2.0.1 masters. Accidental New Calibers version upload. Updated standalone patches from 2.9.0 to have an optional ESL-flagged ESP file rather than ESL, due to new information. These should work without re-ordering issues. Remade all older patches to bring to them parity with their master mods and with new, more accurate and optimal, collision meshes. Patch files will now say which weapon version they are made for to make it easier for me to update them. More consistent versioning from now on in this file - major versions for rebuilds, minor versions for new weapon addition batches, patches for patches. Enables popular weapon mods to work with Visual Reload by Pauderek. I will be updating this with more weapons as time goes on, these are just the weapons I personally use. If you want a weapon added here let me know and I'll get around to it. I'll add most patches into the All in One file eventually, but some mods may stay in the optional files only for whatever reason. If this patch gets big enough I'll probably split the All in One into categories. Now supporting Weaponsmith Extended! Zeridian did 99% of the work on this one but let me upload it here to keep it all in one place, so go give him some Kudos! Many thanks to Cydog2001, who has been adding many new weapon patches while I've been busy! UPDATE V2.0.0 - This update rebuilds all the previous patches to clean up the files, use more accurate and optimal collision meshes, and bring them up to date with their master mods where needed. From V2.0.0 onward this mod page will use a more consistent versioning. Major versions will be for full rebuilds, minor versions will be new weapon addition batches, patch versions will be for bugfixes. Version numbers in the name of standalone patches (Optional Files), eg. `Visual Reload - Crude Blowback V2.3`, will refer to the version of the weapon mod the patch is built for (Version 2.3 of Crude Blowback in this example). All future weapon patches will now indicate which version of the weapon mod the patch is built for in this way. Most weapon mods have their own standalone compatibility patch available in the optional files. Additionally, most of the patches are available in an All in One file that requires all the weapon mods to be downloaded. I will update the AiO when there is a few weapons to add at once. Weapon packs, such as Skibadaa's pack and DOOMBASED's pack, will have their own file under the Main category. They will not be merged into the All in One (unless I end up doing lots of them). 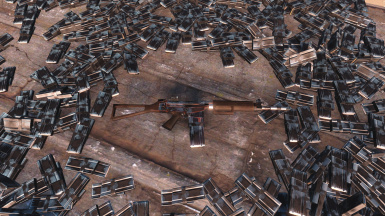 The weapon records in a current save tend to not update correctly in Fallout 4, even sometimes when using the Workshop storage technique. 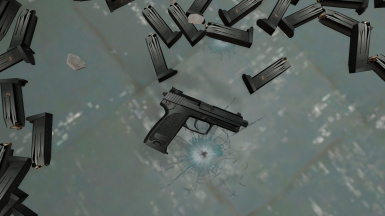 So if you guys ever have problems where the mags for WSE (or vanilla for that matter) don't drop, clear the previous patch version from your save and reinstall.